Get your copy now and watch it over and over with your kids like I did. That has got to be one of my favorite lines from just about any movie I have ever seen, and it just happens to come from one of my favorite kids movies ever. That movie is Disney’s Planes Fire and Rescue which just so happened to come out on Blu-Ray this week. I won’t bore you with a review of the movie again since I did that when it came out in theaters, but I will reassert how much I absolutely love it. The sights and sounds of this movie are even better than the original. It is also an even more touching story than the original because it is based on people who literally risk their lives to keep others safe. Suffice it to say that I watched it three times this weekend (Don’t judge me, I am just an avgeek) and it touches me more every time I watch it. While there aren’t a ton of bonus features, the ones they did add are quite nice. They include an amusing short film about Dusty and Chug performing at an air show in Propwash Junction, a couple of short intro videos of the characters, and my personal favorite, a short feature on the actual firefighters from Chino California that much of the movie was based on. 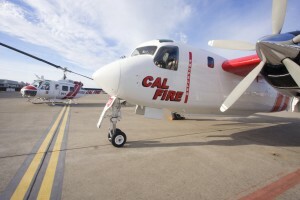 These Cal Fire aircraft inspired much of the movie. The members of Cal Fire risk their lives every year to fight wildfires across the region to protect the lives and property of countless people. The movie mirrored their control tower off the actual tower in Chino as well as basing the Blade character off one of the Cal Fire helicopters. They really did a fantastic job with the technical aspects of the movie, which they also talk about during the special features. There is a little bit of artistic freedom, but the vast majority of the flying is spot on and really makes an avgeek like me anxious to get out and fly. The Blu-Ray, DVD, and digital edition are available on Amazon and will be at your house in two days or less if you have Amazon Prime. If you need a little eye candy to push you over the edge to buy it, just take a look at the trailer below. After you do come back and leave a comment, I would love to hear about how much you and your kids love it. The star of the show is once again Dusty, but he has more great company in this movie. With all of the negative press in aviation right now, it was really refreshing to take a step back and just enjoy a beautifully made movie about planes. Planes Fire and Rescue is the much-anticipated (at least for avgeeks) sequel to the Planes movie that was released last year during Osh13. I was so excited to see it that I couldn’t wait to get back home to go with my kids, so I just went by myself. After I got past the creepy looks people were giving me as they walked in with their kids, I was able to sit back and just enjoy the show. I’m not one to just recap a movie because you can get that on IMDb or a dozen other movie sites. I prefer to focus on the sights and sounds of the planes which is what we all love anyway. One of the first things that really caught my attention in this movie was the excellent use of music to add to the story. The first occurrence was the playing of AC/DC’s Thunderstruck as the fire crews are preparing to fight a fire. It really added to the momentum that was building in the movie. There were also a couple of great songs by Brad Paisley that I really enjoyed. One in particular is called All-in that is a great tribute to all firefighters, but particularly to those who fight wildfires. This song will never have the following of Let it Go from Frozen, but it deserves even more attention because of the message it shares. To go a long with the great music, there was of course the great sound of airborne engines. Cabbie is probably my favorite character, but I am biased. My personal favorite of course was the old cargo plane “Cabbie”. They never say exactly what type of plane he is, but my best guess is that he is Fairchild C-119 better known as the Flying Boxcar. Sure I’m a little biased since my current squadron flew them back in the day, but it is a great plane that sounds even better. I even enjoyed the helicopters that are an essential part of the firefighting effort. There was also a lot of great little one liners from the various characters in the movie that even make grown-ups laugh. I actually enjoyed these characters a lot more than the supporting characters in the first movie. They did a much better job of translating real people into these characters, much the way that the Cars movies did. The story had its typical unrealistic and cheesy parts just like any Disney movie, but I really enjoyed the overall message, and the real emphasis that was placed on the team in this movie. I can only hope that it will strike at the heart of more young people and get them excited about flying. At the end of the day it was a highly entertaining movie with stunningly beautiful animation. It is the perfect movie to sit down and enjoy with your kids, or even by yourself. I had no idea just how out of the loop I was until I saw that this trailer was released a month ago. Then again, I also missed the DVD/Blu-Ray release of the original this week, but only by a couple of days. It does seem kind of strange to me that the sequel to Planes is following so closely on the tail of the original, but I guess that is just the way things are moving. Either way, I am incredibly excited about this movie, just like I was for the first one. 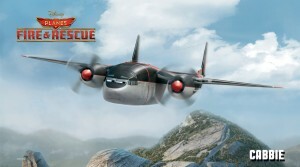 Planes: Fire and Rescue is the continued story of Dusty Crophopper, once again voiced by Dane Cook. Upon learning he can never race again due to a bad engine, he shifts his efforts to aerial firefighting, and some real heroes. It remains to be seen what path the story will actually follow, but based on the original, and the teaser trailer above, I have high hopes that this movie will also be a beautiful mixture of aircraft sights and sounds. There is much criticism out there of Disney’s lack of creativity that I just don’t understand. People didn’t complain when they made 10 princess movies in a row that all follow essentially the same storyline, so why all the heartache that they are making movies about cars and planes? Pretty much every kid’s movie has a similar story, but I guess most of those people forget that these movies are geared towards children and not adults. That being said, I know a lot of adults that will be there when this movie opens. If there is any doubt of that, consider the 15,000 that showed up for the premier of the original at EAA Airventure this last summer. That is one of the awesome things about aviation; it truly bridges all age, race, and gender gaps. No one cares who you are or where you come from as long as you love planes. In fact, we find it more exciting to hear about those unusual planes, pilots, and circumstances that inevitably pop up in aviation. I really hope that these movies continue to spark a love of aviation in children that will inspire them to chase their dreams and pursue careers in aviation. Aircraft will never go away, but if we don’t do our best to foster a true passion for aviation, the wonder of it may start to wane. I don’t know how I could have missed this release, oh wait…I’m on the other side of the world. Either way, the blessed day has arrived and you can finally bring Disney’s Planes home on DVD/Blu-ray. For all of us Avgeeks this is one of the best movies that Disney has ever made. I am well aware that it took a lot of criticism from critics who expect a children’s movie to be educational and thought-provoking and obviously something other than entertaining. The reality is that the story of Dusty Crophopper was incredibly well done. The animation was clean and crisp and beautiful. The aircraft are varied and original. The sounds are so real I felt like I was at the airport a few times. Overall it was a great little story about the underdog winning, and who really gets tired of that? You can read my full review of the movie from when I saw it at the theater, or you can just buy it yourself and enjoy the wonder that is Disney’s Planes. I also just found a teaser trailer for the second installment that was just recently released, and it looks just as awesome. To give you some indication of how great this movie is, within the first ten seconds of the movie my son excitedly screamed, “AIRPLANES!” Now at only two years old he is somewhat easily impressed, but his smile was satisfaction enough for me. The opening scene awakened everything I have loved about planes since I was a very little boy. From there on in it just kept getting better and better. I found the animation to be exceptionally clear and clean. The scenery was beautiful and the planes were stunning, but he part that really struck me was the sound. Clearly there is nothing quite the same as seeing and hearing the real planes in person, but about halfway through the movie when Skipper the Corsair fired up his engine it gave me the chills. I found myself ignoring the dialogue at times in the movie just listening to the sounds. Along with all of the beautiful sounds of engines, it was also fun to hear some of the different voices of the characters. Most notably to me were the voices of Iceman (Val Kilmer) and Goose (Anthony Edwards) from Top Gun. That was the movie that really sparked my love of aviation so it was fun to me to hear their voices again. 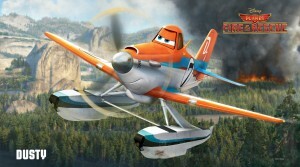 Obviously the story is not realistic as there is no possible way that a crop duster could keep up with any actual racing aircraft, but that is what animated movies should be about. Kids should be encouraged to shoot for the impossible. We should all long to have lofty dreams that takes our utmost to accomplish. How many movies these days truly inspire kids to shoot for the stars anymore? Most shows these days are trying to turn kids into teenagers before they even start school. Instead this movie is just a simple story about a simple character that has a huge dream that he makes a reality. What could be better in a story for children than that? Admittedly, I am a huge avgeek, and that likely plays into how much I love this movie, but I honestly feel like it could have a huge impact on the future of aviation. Kids need something more to be passionate about than stupid pop stars. It was awesome to hear a group of kids with their parents outside the theater saying, “That was an awesome movie. We need to buy it on DVD,” and their parents immediately responding, “Definitely.” This is the kind of start that we need in general aviation. There is so much more I would love to say about this movie, but I honestly could not say it better than Dan Pimentel, of the Airplanista Aviation Blog, did in his review of the movie after seeing it last week at EAA Airventure in OshKosh Wisconsin. If you need just a little glimpse at the beauty of this film just take a look at the trailer. Then hurry out to the theater and enjoy an hour and a half of pure animated aviation awesomeness. I know this isn’t exactly breaking news, but I just had to share it because I am so excited. Ender’s Game is one of those books that I could read over and over again. It takes my mind to so many different places, and makes me take a whole new look at things I thought I understood. As a flyer it also gave me a new perception of working in three dimensions, and working as part of a crew. There are all kinds of insights in the book that have even been taught in military training courses. The movie looks absolutely awesome and I am thrilled about their casting choices. I have waited a long, long time for this movie, and I hope it meets my expectations. So enjoy this little Friday treat. Are there other flying/space books you would like to see made into movies? As a parent of three kids I am very familiar with kids movies, and I honestly don’t mind going to them as long as they are entertaining, which many of them are. But, there is a movie coming out that I would gladly see all by myself, as will most avgeeks out there. Many people are familiar with Disney’s Cars featuring Lightning McQueen and the ever lovable Tow Mater. 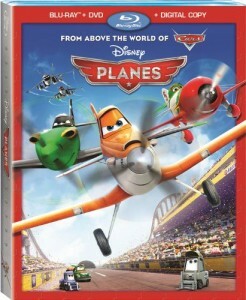 Planes is a similar idea, only it features airplanes instead of just cars. At one point there was word that it would only be released to DVD, but thankfully Disney saw how important it would be to view it on the big screen and is going for the full theatrical release. They will also be releasing it in 3D, but I think that is a waste of money so I will stick with the normal version. Disney recently released a new trailer which can be found below, and it looks awesome. I can’t tell you how excited I am. I could keep going on, but I will let you enjoy the brilliance below instead. The film is set to be released on August 9. Aviation is one of those rare topics that has almost universal interest. There is just something about the wonder of flight that intrigues just about everyone. This may have been even more the case back in the World War II era when flying was a luxury for the rich, and a relative infant in the military. Such was the case of the Tuskegee Airmen who had a passion for flying and an unflinching desire to serve their country in a time of war. Much has been written and produced concerning these heroic men so I will leave the specifics of their actions to those who have undoubtedly done a better job than I ever could. With the upcoming release of Red Tails, which details their story (trailer can be found below), I thought it would be appropriate to bring some attention to the previously released The Tuskegee Airmen (trailer also can be found below). It was a great film done by HBO which also told this story. The original film was a great historical representation of what these men went through as well as a small sampling of their heroic actions. It gives a nice perspective of who these men were and what they accomplished. Going through a formal flying training program, as I currently am, is hard enough. I cannot begin to imagine how much more difficult it would have been to also have to battle racial barriers that paid no attention to your abilities but simply the color of your skin. Red Tails appears to be a little more “Hollywood”, CGI, and pyrotechnics than the original, but I sincerely hope that it will be a movie worthy of the men that it is based on. I did find it to be a nice touch that Cuba Gooding Jr. was cast into the current movie as he was in the original. The official website for the movie provides a lot of great information about the movie that got me even more excited about its upcoming release. The movie will be in theaters Jan. 20.